Green smoothies are perfect for anyone looking for a healthy weight watchers smoothie. They are extremely low in calories and fat; high in fiber; and loaded with phytonutrients! 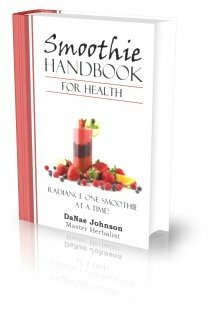 Under each smoothie recipe, I have added up the calories, fat, and fiber content. For your convenience, I labeled each of the weight watcher smoothies with how many points they contain. While doing this process… I was truly impressed on the numbers. Check them out and see for yourself. Smoothies are a great meal replacement for anyone on weight watchers or other weight loss program. Can't wait to try more nutrient dense green smoothies? So...in my new book, "Smoothie Handbook for Health", I’ve done all the up-front work for you. I’ve calculated the calories, fat content, sodium, carbohydrates, fiber, sugar, and protein, as well as the percentages of Vitamin A and C, calcium, and iron.